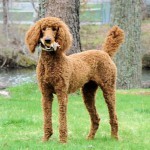 My husband and I are hoping to bring a poodle into our family within the next year. 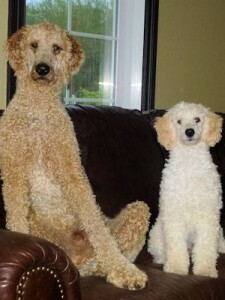 My parents have had standard poodles for years – three from your farm. We love poodles and can’t imagine bringing any puppy but a Fairhill puppy into our home. Here are pictures of my family’s current Fairhill girls – Freddie (4 years old) and Bluebelle (age 6). 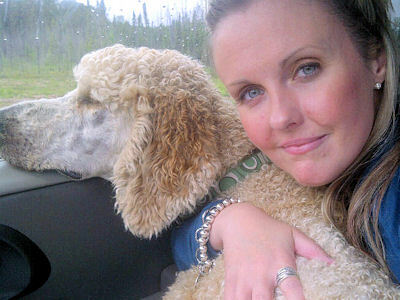 They’re such a significant part of our family… Freddie is a truly beautiful dog, and she’s very smart. 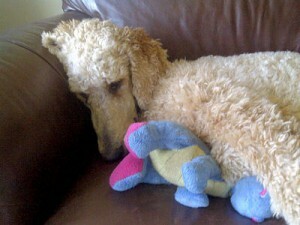 In a perfect world I’d love to clone Bluebelle; she has the sweetest heart and is unbelievably gentle. This past year Peregrine placed sixth for children’s hunter horse Zone 2 and is qualified for Zone 2 finals – the most competitive in the US. He qualified and competed in the $250,000.00 Hunter Prix Final at Saugerties and just missed the top twenty-five. He stayed sound for thirty-one horse shows. 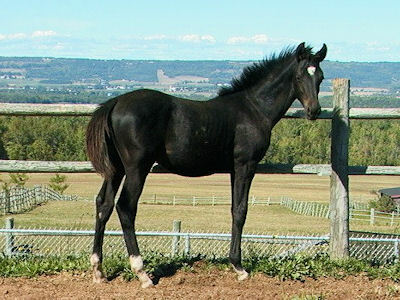 Peregrine had seven championships and three reserves. 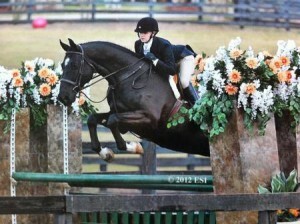 Sadly he is for sale as his rider is off to college. 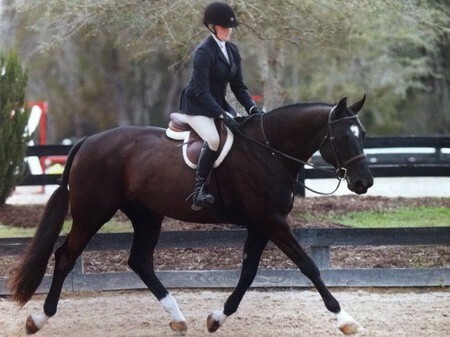 This horse has been beyond amazing and it has been an honor to own him. Lucas has blessed our home in many ways. He is a great friend; loyal, funny, and very handsome. He hasn’t attended school yet but we have plans for that in the fall. 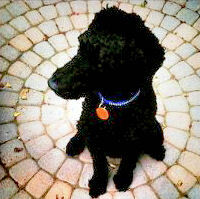 He is a good boy around the house, but does not see the intrinsic value of “come” yet. I remember that you warned me that could happen. Lucas has won my husband’s heart and proven to him that poodles can be a man’s dog. 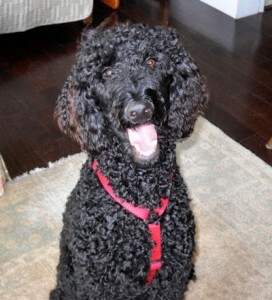 Lucas has a wonderful temperament, is very kind and has warmed our hearts as well as our friends. He’s also a big hit on the Bedford waterfront! 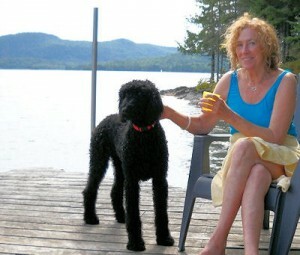 I check in on your website every once in a while and enjoy the posts to the Poodle Lady. 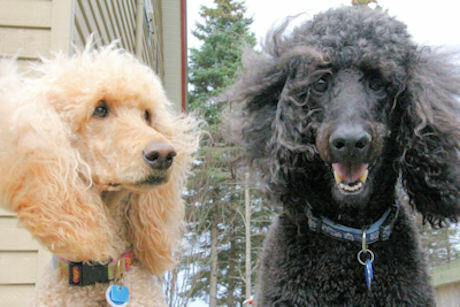 It’s a great way to see how your poodles continue their lives with their new families. You must enjoy the communication. Among the thousands of photos I take of our Gus and Belle, every once and awhile a unique one turns out that describes each one to a “T”. 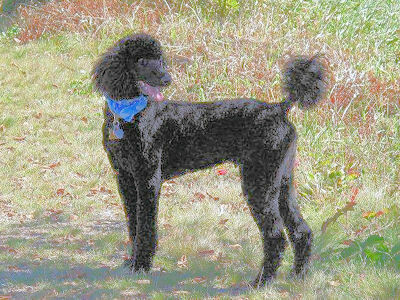 Gussie-boy at his prime… smiling, wind blowing his hair and ready for action. What a joy he has been for the past eight years. Time really does fly… just like him. 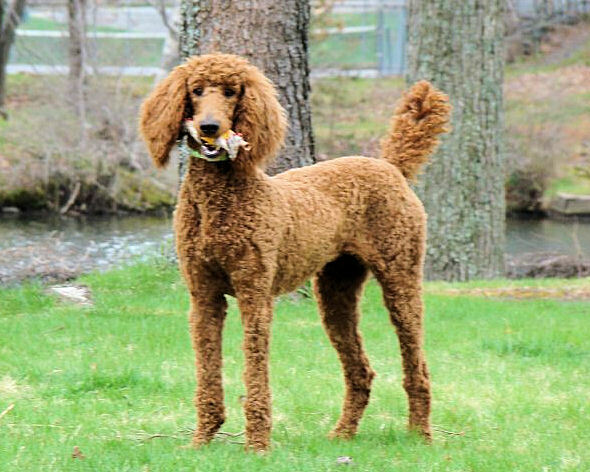 He’s our boy and hasn’t changed a bit from when he was just a puppy… always on the go, never walks, leads the way at a jog or a run. He just loves being a farm dog! Gus is such a good guy. 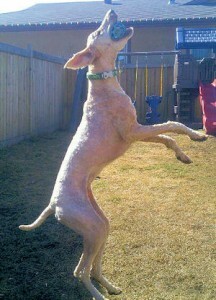 He usually weighs in around 90 lbs but flies about as if he is half that size. He is a pleasure to have as a companion. Then there’s my sweet pea Bellie. Kind, gentle, reserved but still my lovely, always stylishly slim and stunning girl as she shadows my every move in her aging years. At twelve she has slowed down, has a few little tremors and is a little weaker in getting around from time to time, but she is a remarkable gal. I am so glad I found your farm all those years ago, Kathryn, because she has been the little girl I never had. Belle and Gus have been fabulous with receiving new kitties as sisters and brothers. We seem to continually have a houseful of hairy kids and it’s wonderful! Thought you would enjoy an update on Deo who is absolutely wonderful. He is a very intelligent, sweet and sensitive guy. We adopted a miniature poodle puppy from a breeder in Saskatchewan earlier this year. Deo and Hansel have become the best of friends. Deo is getting ready to head south for his first goose hunting trip with my husband. They have been training for this all summer, and Leon is very excited to see how Deo performs in the field. We will send photos of Deo during the hunt.